LETTER FROM THE FASHION EDITOR EDITORIALS & CALEZINE Welcome to the issue #0 of CalEzine. Let me introduce myself. I am a visual designer, trends devotee, jewel art worker and magazine enthusiast. I work in Rome as fashion editor and I really believe that no matter whether a magazine is delivered to your doorstep or to your computer, printed on glossy stock or on cheap tabloid paper, it is foremost the work of an artistic team, a package of ideas tailored for spreading. This is a project that I particularly like because it combines my previous experiences as calendars art director with my work as fashion editor. For those of us fond of fashion photography ad addicted to storytelling, I chosed to experiment a new kind of visual calendar conceived in a magazine template, based on main pics from editorials released in Rome that I featured during 2015, as contributor, in national and international printed magazines. In other words, for the very first time I wanted to realize a visual editorial project in calendar format. Why cal-e-zine? CAL as calendar, E as editorial, ZINE as magazine. The graphics was edited by Antonia Lombardi, a very talented student at the Foggia Academy of Fine Arts. She is a very stylish and tasteful graphic designer in love with editorial graphics, who helped me to mash up this calendar project with the taste of a fashion magazine. I hope you enjoy. The 2016 is a leap year and tomorrow is the first blank page of a 366 storytelling page book. Release a good one. This visual project is based on photoshoots made in Rome by various artistic teams according to the credits written on each page, which have been featured on national and international fashion magazines. It does not represent a journalistic head as comes featured without some periodicity. It does not be able so to consider itself a publishing product to the senses of the Law n° 62 – 07/03/2001. 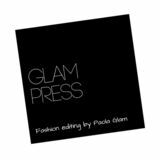 °Fashion Editorial Magazine Calendar° Paola Glam: Visual designer & fashion editor. Antonella Lombardi: Graphic designer.